These days, most of us have mobile phones that double as music players. And as a result, there are lots of people out there walking the streets while listening to music on their phones. But what do you do if you want to play your phones’ music through some speakers in the office or at home? Most phones don’t have a 3.5mm headphone jack so it’s almost impossible to attach anything to them apart from their own proprietary headphones. The Gear4 BluStream RX is a Bluetooth receiver that solves this problem for you. 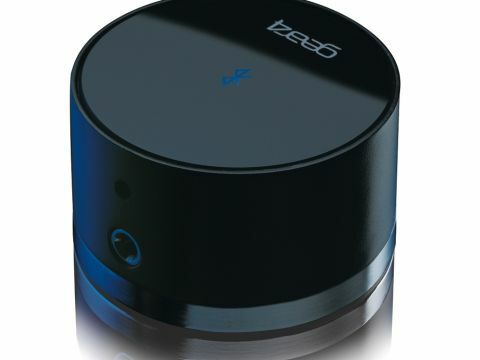 It acts as a conduit to stream your music wirelessly from your phone, into your hi-fi. There are several factors to consider here; sound quality, ease of use, practicality and of course, price. Clearly, any music being transmitted via Bluetooth is not going to get anywhere near resembling high fidelity when it comes out the other end. So if you listen using a good amplifier and some decent speakers you’re going to notice a bit of background noise. But that’s absolutely standard when it comes to Bluetooth, so you can’t really hold it against the BluStream RX. On the upside, it really is incredibly easy to use. You simply plug it into the power using the included plug, and then activate Bluetooth on your phone/MP3 player/other device. Run a search for Bluetooth devices and when you find the BluStream RX-Gear4, that’s what you need to pair it with. From then on it’s super-easy. Just play the music you want on your portable device and the music will be channelled through the Bluetooth dongle and out through a 3.5mm audio jack. One thing to watch out for here: most phones will send the audio at optimum volume levels and so if you plug headphones straight into the dongle, you won’t be able to change that volume – and it’ll probably be too loud – unless your headphones have a volume control built in, that is. It’s a very easy gadget to use then, and it’s also pretty small. Not so small that it could get lost, but not so big that it starts getting in the way of anything. And there’s not really much more to say about it. The £50 price-tag might be a stumbling point for some, but for anyone who really wants to connect their Bluetooth music player to their hi-fi, this is a cool little product which delivers exactly what it promises.